Pulseway’s new SaaS Enterprise Server enables small Managed Service Providers to leverage the cloud for system and service monitoring, real-time alert notification, and granular remote management of a diverse array of operating systems and applications. If you’ve ever wanted to go into business for yourself as an MSP, there’s no better time or no better software to get you there. When you think of managed services or managed services providers (MSPs), you might assume that they’re all staffed by dozens or perhaps hundreds of people working around the clock to support their customers. That might be true for a small percentage of MSPs, but did you know that most MSP businesses have fewer than 50 employees? The MSP space is growing at a double-digit pace and some MSPs report triple-digit growth. And this isn’t a trend that just began with the introduction of cloud technologies, it’s been growing at or near this rate since 2000. Smaller MSPs see higher rates of growth than their larger counterparts do. Generally speaking, the largest MSPs continue to enjoy success, but in many cases annual growth rates for large MSPs have slowed to single-digits. The fastest-growing MSPs are those that successfully blended mobile, hybrid cloud and application-level management. Also, many of the top-rated MSPs are thriving in extremely targeted markets – such as the hedge fund vertical. If you think that the MSP market is saturated, it isn’t. In fact, it’s far from it with these kinds of reported growth numbers. MSPs that deliver great service at competitive prices have the most success, even in markets or locations that appear overcrowded. With Pulseway’s SaaS Enterprise Server, not only can you setup monitoring and alert notifications for a variety of systems, services, and applications, but you can also manage those systems from any device, including mobile devices via Pulseway’s secure apps. For more videos that demonstrate Pulseway’s mobile management, check out the Pulseway YouTube Channel. With Pulseway’s service, you can monitor and completely manage Mac OS X, Windows, and Linux systems. You have fully control over each operating system within the same interface. And you can monitor and manage desktop or server systems. Heterogeneous environments are no problem for Pulseway. You can configure custom monitoring, alerting, and management for all your systems either through the easy to use Windows application or by editing the /etc/pulseway/config.xml file on Linux and Mac OS X systems. You can also manage notifications for host status, ping of various other hosts, storage, website availability, and SSL certification expiration. Download the Pulseway agents and get started right away with the standard, free option or you can take the 30-day free trial of the SaaS Enterprise Server. Pulseway’s friendly interface and quick setup are perfect for consultancies and MSPs who want to offer a wider range of services, remote management, and real-time monitoring for their customers. There’s no lengthy training required, no huge licensing fees, no datacenter equipment maintenance, and no hassles or long-term contracts to prevent you from adding Pulseway to your toolbox. Run command line commands (All operating systems). Carry on real-time chat with users. Logoff the current user or lock the desktop. Restart, Shutdown, Power off, Suspend, or Hibernate the system. View disk space and browse filesystems. From a technical perspective, Pulseway’s management capability gives you deep insight into your monitored systems. From command line interface, to service management, to filesystem access; you have it all at your fingertips, literally, with Pulseway’s mobile app. You can stop, start, and restart services. You can issue commands at the command line with any operating system. On Windows, you have the added capability of being able to issue PowerShell cmdlets. You can apply Windows Updates to Windows operating systems. You can update Linux systems via the command line. And you can connect via RDP to your Windows systems for a full graphical desktop-level experience. Pulseway is a frugal choice for MSPs and consultants because you don’t have to spend a lot of money to setup your own infrastructure, you don’t have to hire a team of support people to monitor and manage it, and you don’t have to worry about some crazy licensing scheme that extracts all of your profits from your business. 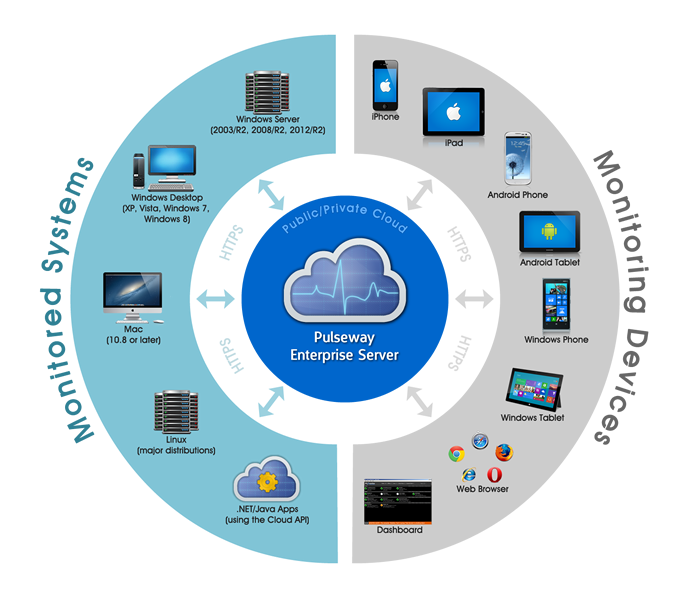 Pulseway is enterprise monitoring, alerting, and management for all your computers that allows you to monitor 24x7x365, receive alerts, respond to problems no matter where you are, and from any device.